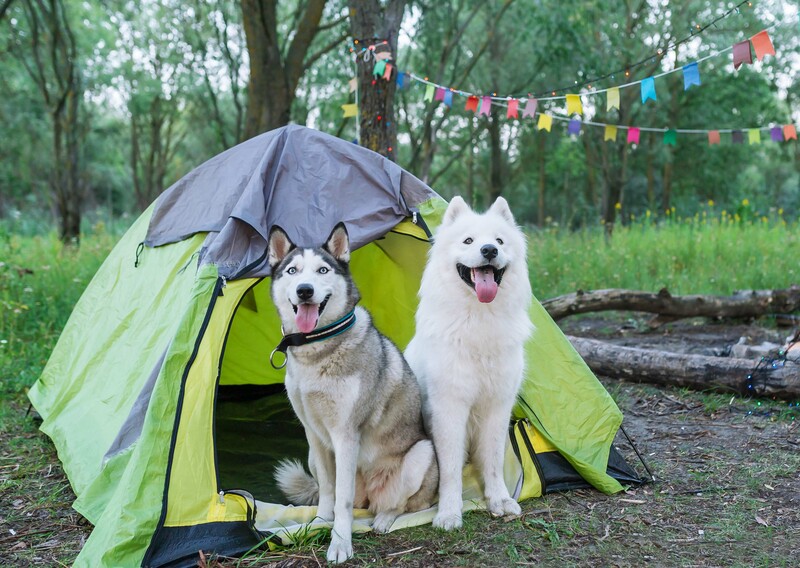 Lowdown: Dogs make camping more fun every time, even if they don’t help with your sleep, or cleanliness. There is something primal about camping out with dogs. They are natural camp guards and enjoy the experience as much as the rest of the team. Pros: New smells, new friends and BBQ treats, the excitement is infectious. Need to know: It means carrying extra supplies such as dog food and towels if you’re hiking and being vigilant to prevent scavenging if you’re camping around other people. Top tip: If you’re serious about sleeping, create a space for your dog in your tent’s porch and not inside. 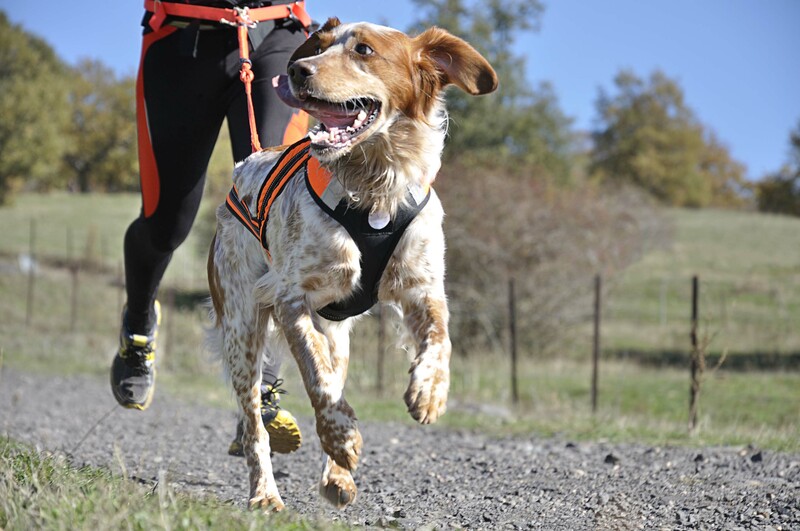 Lowdown: This is the sport of cross-country running with your dog. Unlike your evening jog where Fido’s doing his own thing, canicross requires that you work together. Dogs are harnessed and lead the way, attached by an elastic leash to the runner, who drives the dog with voice commands. Pros: Canicross really lets you develop a working relationship with your dog and is great for both of your fitness. Need to know: It doesn’t suit all breeds, especially dogs that love to run around in circles or dive into the nearest hedgerow. More info here. Top tip: Teach your dog mushers’ commands: “Gee” is go right and “Haw” is left. 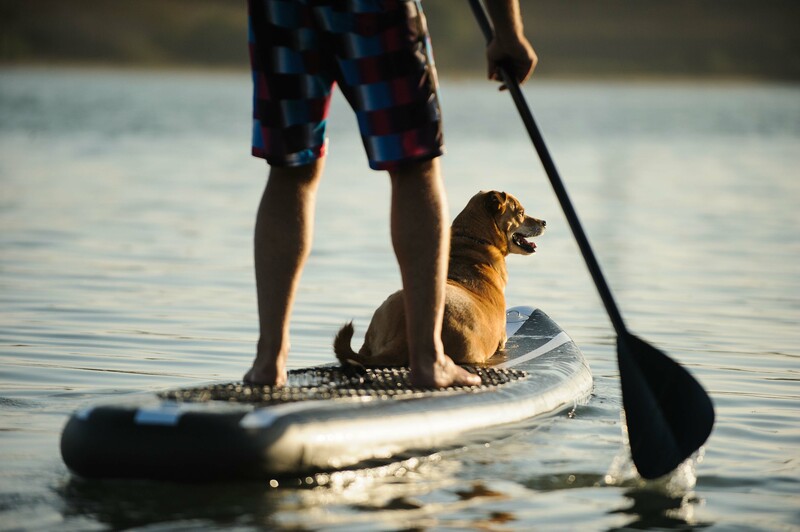 Lowdown: Stand Up Paddleboarding (SUP) is one of the fastest-growing watersports – and there’s no reason four-paws can’t join you too. The only skill required of your dog is an ability to sit still, which gets incrementally more important the bigger your dog. The more your dog moves about, the less stable you are. Pros: The amused looks from other SUPs. 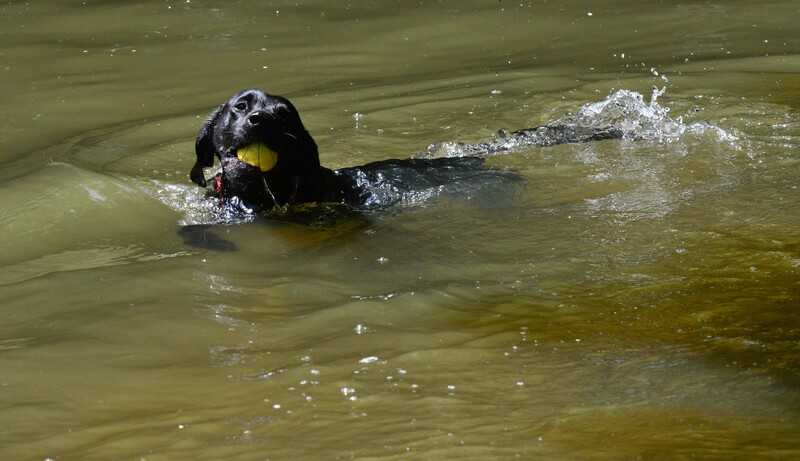 Need to know: Having a dog who loves swimming is not necessarily a good thing as getting them back on board can be a challenge. (Never pull by the collar – invest in a harness). However, if the worst happens, at least you know your phone will be ok. The Land Rover Explore Outdoor Phone is waterproof to 1m. Use the carabiner to clip it somewhere safe. Top tip: Try a doggie SUP lesson in North Wales. Lowdown: There are few things in life more pleasurable than a country walk with your dog before retiring to a traditional pub. Pros: Happiness is a cask ale beside a fire after a long walk, with your dog at your feet. Need to know: The Good Pub Guide lets you search for dog-friendly pubs. The ViewRanger App (pre-installed on the Explore phone) lets you search and follow classic walks. Top tip: Have a towel handy. Even dog-friendly pubs will appreciate you giving your dog a quick rub-down before entering. Lowdown: Your dog has evolved over millennia to cover huge distances across the wild – just like you. 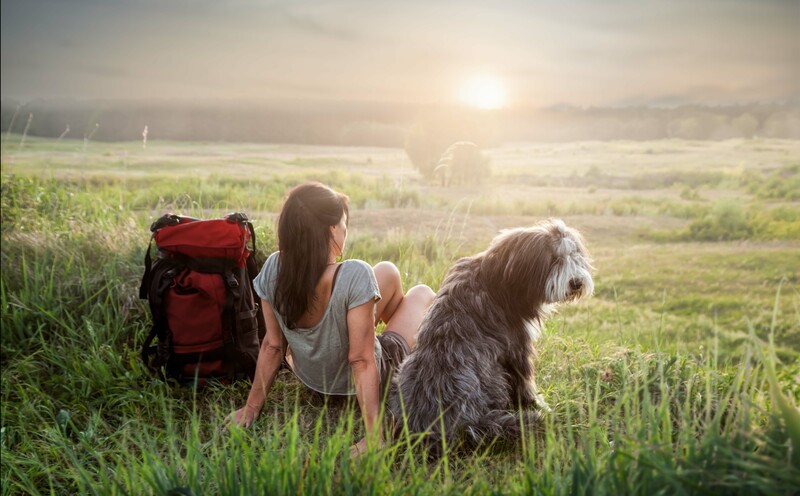 There’s no reason your dog can’t accompany you whether you’re hiking the Appalachian trail on America’s East Coast, the UK’s Pennine Way or the Camino de Santiago. Pros: On a long distance hike, you always need someone to talk to. Your dog is a faithful listener. Need to know: Make sure you do your homework wherever you go. Some parks require your dog to be on a lead and only allow them in certain areas. In Europe, restaurants and hotels are generally more welcoming to dogs but some mountain huts won’t allow them inside. 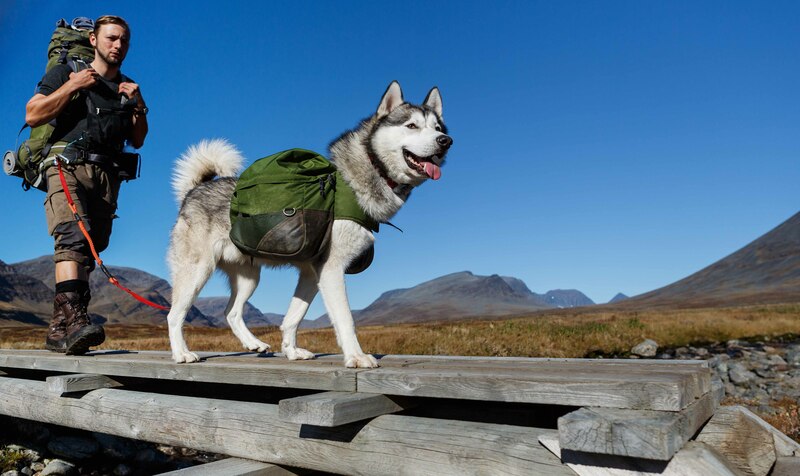 Top tip: Invest in a good set of doggy panniers so your pooch can pull their own weight. Lowdown: Swimming out in the open – it’s invigorating, re-energising and one of the most popular ways to reconnect with nature. Dogs also love a paddle. Pros: Being able to take your dog on your amphibious adventures and not leave them behind. Need to know: Don’t allow your dog to swim too close – unless you want to look like you’ve been pawed by a bear. Dogs’ claws are sharp. Consider wearing an old wetsuit. Top tip: Get a proper harness for your dog so you can help them out of the water safely. Lowdown: Probably the one adventure your dog will thank you for leaving them behind, dog-sledding is arguably the closest you’ll get to discovering the unique bond between mankind and dogs. 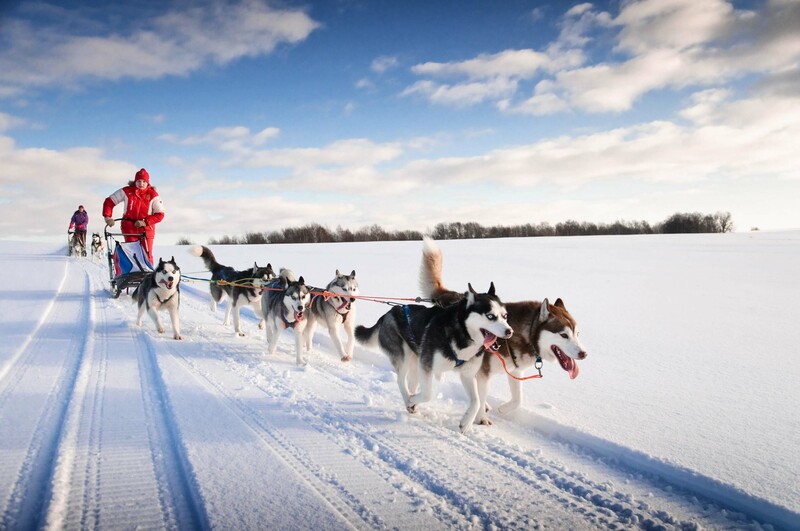 Need to know: Dog sledding requires some serious winter and dog-handling skills – not to mention some warm underwear. Fortunately, you don’t have to worry about the Explore phone. It’s perfectly adapted for the cold. Unlike regular smartphones that cease to work around freezing, the Explore works in temperatures as low as -30º and has a touch screen you can use with your gloves on. More winter features are discussed here. Pros: When you’re driving a pack of huskies and everyone’s working together, the feeling is incomparable. Top Tip: Brake before bends and remember to lean into the corner to prevent the sleigh flipping.